Anthony Joshua is out for revenge when he faces long-time rival Dillian Whyte for the British and Commonwealth heavyweight titles in a battle of unbeaten heavyweights on Saturday night at The O2 Arena in London. This article contains our JOSHUA v WHYTE betting preview, with free tips, predictions, enhanced odds, free bets and no deposit bonuses on the fight! Dillian Whyte won the pair's first meeting on points at amateur level in 2011 (flooring Joshua en-route) when Whyte was fighting for the first time after switching from kick boxing. Anyway, it was AJ who went on to claim Olympic Gold three years later. Anthony Joshua has won all 14 of his professional bouts in convincing fashion – only going beyond the second round twice. Joshua has not been troubled so far as he has put away the likes of Gary Cornish, Michael Sprott and Matt Skelton. Even Kevin Johnson, who had previously never been stopped in 36 fights, was taken out by Joshua in the second round. Dillian Whyte will be the sternest test of AJ's career so far but Eddie Hearn would never have risked making such a match-up if he didn't seriously believe Joshua could and probably would win. Joshua has good upper body movement, operates behind a stiff jab and has obvious fight-ending power. He's improved immeasurably in and out of the ring since 2011. He's the more rounded fighter and seems to have advantages in hand speed, reach, power and timing. Dillian Whyte has won all 16 of his professional fights and 13 of them have come by the way of KO. He hasn't been past four rounds so far. Anyway, when beating Brian Minto, Whyte got the job done but looked disjointed and ungainly at times. He also served a two year drug suspension from November 2012, with him testing positive for the banned supplement Methylhexaneamine. 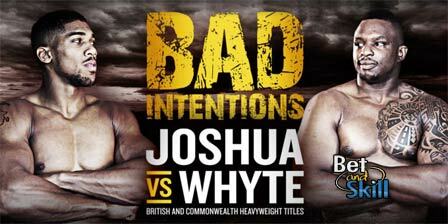 Whyte is a solid boxer, who clearly has power in his right hand, as we have seen on more than one occasion. The Jamaican born fighter can often be accused of throwing a lazy jab, also tending to dip his head when throwing the jab. With the fast right hand of Joshua, this is a dangerous tactic. Price boost: 3/1 Joshua to win + refund if you lose! "Anthony Joshua v Dillian Whyte betting tips, predictions, odds and free bets (Boxing - 12/12/2015)"